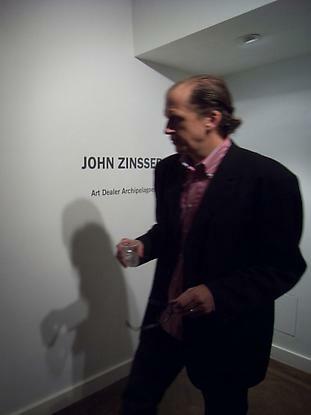 I saw Zinsser a few weeks ago at an opening for Diti Almog at Space Surplus in Tribeca (well worth the visit, by the way), and he warned me that his new show would differ substantially from the work I have known for two decades. Sure enough, he was right. These small pencil/graphite drawings on paper capture another side of the artist, quite distinct from his consummate handling of paint in larger abstract compositions. Since he is also an established critic and lecturer, we would have to ascribe this work to his more pedagogic nature. Which side of the brain is that again? 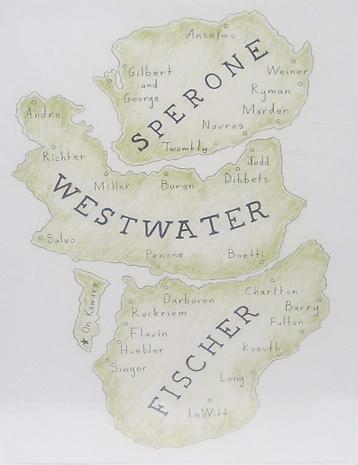 Each of his imagined gallery islands is defined as a separate land mass and dotted with cities or villages named after their respective stable of artists. We detect the sly wit of a long time participant in the scene, keen to slight changes in barometric pressure; the critical eye and astute judgment of a political historian; and the close observation of micro-economies and art world realpolitik which is the secret, whispered rumor mill motivating much of our own gossip and reverie. Who is showing with whom? Who has left whom, and for whom? Who has dropped whom? Who has stolen whom, and from whom? Who has gotten whom into who's gallery? Who has threatened to leave their gallery unless whom was dropped? It references the polymorphous perverse, like the Kama Sutra. The combinations and re-combinations can seemingly abound hilariously and almost infinitely. The pleasure of Zinsser's work is not only his tinkering with art world shibboleths and his conflating of usages from the political to the artistic. 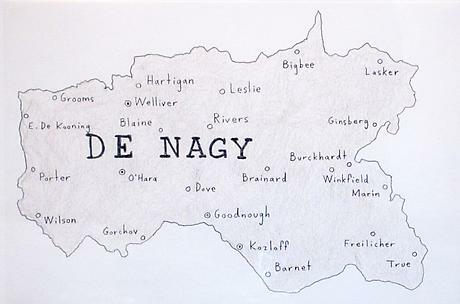 To a former military history nerd like myself, who has played more than one game of RISK or Stratego, it is the finely drawn and shaded maps themselves, with an eye to the particular details and choices the artist has made. Why, for example, is "On Kawara" the capital of "Sperone", and on its own separate islet? Why is the long island of "Castelli" separated into two groupings of artists/cities at north and south, with the long middle essentially vacant, except for a craggy peninsula containing a very isolated "Johns"? 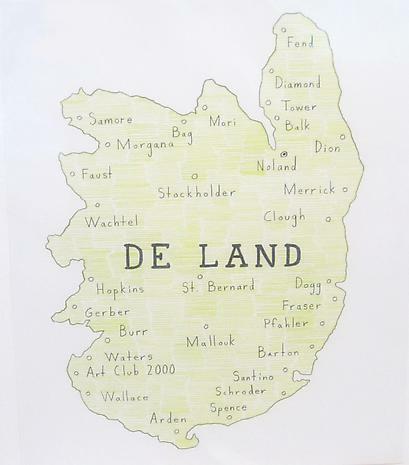 Why is "Noland" the only major city on "De Land", whereas "Gibson" has three: "Armleder", "Broodthaers" and "Christo"? 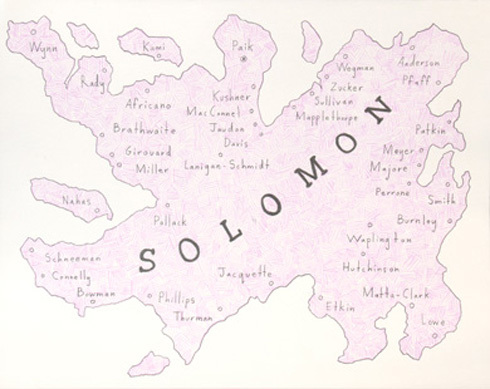 Why is "Koons" given his own, separate islet on "Sonnabend", but just across a narrow strait from his Neo-Geo compatriots Halley, Vaisman and Bickerton? Why is "Acconci" the capital and not an equally worthy "Baldessari" or "Kounellis"? These are the sorts of questions that could keep you up at night if you let them. There are other gallery islands in addition to the ones pictured in this article, close to twenty all told. Some of them no longer exist as functioning entities - Bykert, Civilian Warfare, Willard, Richard Bellamy, Holly Solomon - and this is perhaps why they are included, to give a feeling of the long haul, a testament to mortality, to changing fortunes, to natural laws of entropy, to the thrill of victory and the agony of defeat. But most of all, a testament to Zinsser's benevolent and inclusive memory, and to the rich panoply he manages to invoke from a life spent not just painting, but also keenly observing the arcane calculus of the haute art milieu. 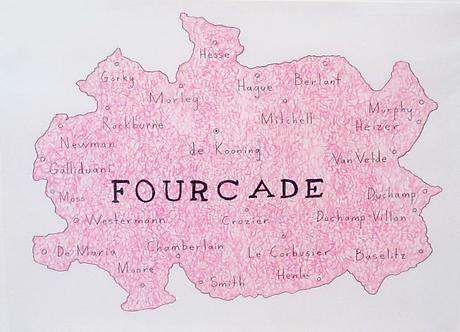 In their meticulous draftsmanship, their attention to placement and power, their fixation on the schematic, their suggestion of gamesmanship and of a fictional, symbolic geography, these pieces are part of a continuum that includes artists like Guillermo Kuitca and Mark Lombardi, but without the heavy, doleful doses of orchestrated meaning. In case I have not made it clear, this is a very funny show. Dry, to be sure, but exceedingly droll. It continues with another body of work, small drawings of pages from auction catalogs. While lovingly detailed and well rendered, these do not pack the same wallop as the maps, principally because they are not maps and lack that intrinsic narrative power, that fanciful romance associated with the gallery as city state. When we view a mid-period Stella on the block at Sotheby's, we certainly confront important aspects of history and the marketplace, even the material pathos of the art object. But we are denied the broad sweep, the metaphoric potential for the tragic and the heroic that is suggested by Zinsser's miniature kingdoms of art. Submitted by Steven Kaplan on Sat, 2014-04-12 10:30.